It's 2017, and time to get cranking on a new car project! Late Friday night 3 weeks ago we fired the 318 cubic inch V8 up and loaded it onto a trailed to get it across town to our good friend (and expert race car driver, instructor, and fabricator) Chuck's shop. We get tetanus just looking at this thing. The car came with lots of scrap and spare parts. Time to sort it out. First and foremost, this car was suffering from an ailing (possibly original) automatic 3 speed transmission that needed replacing. Thanks to Kyle's awesome research and forum crawling skills, we landed a magic combination of modern transmission parts that would supposedly bolt up to our 70s motor. With the engine out, Landon goes to town with the sparks and makes way for a manual shifter. Projects continued through the second weekend with a tear down of the shift column to replace a few bushings to keep it from bending even further out of alignment and give it some fresh grease and seals. Luke, our team electrical engineer dug deep and got us set up with all new wiring, switches and proper soldering and connectors. The original wiring was a complete rats nest mixed with new wires that seemed hastily spliced together. We're still impressed the car even ran with the old wires. Some new wires in the car, the guys make some connections with the motor back in the car. Hey, is that a manual shift knob there? Yep! Come on, this is Lemons, it's supposed to be a $500 car and you guys are doing all this work and certainly making this car too nice! Yeah...but did we highlight the swiss cheese sheet metal that's somehow still attached to the frame? The third weekend brought the third pedal! 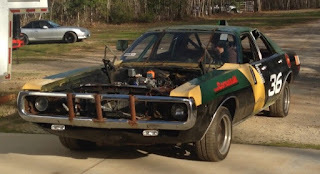 At the end of the third straight weekend, we finally got it fired up and running with a new transmission, new wires, and a lot less scrap metal hanging out in the trunk. It was an awesome team effort. Everyone chipped in big time and made it happen. For now the brakes don't work too well, the rear differential is out of fluid, there's no grease left in the rear wheel bearings, the wheel bearings are all about shot, the wiring isn't completely done, it's still rusting away, the ball joints are all about gone, it needs new tires, and generally needs a little bit more love. But it runs and drives! 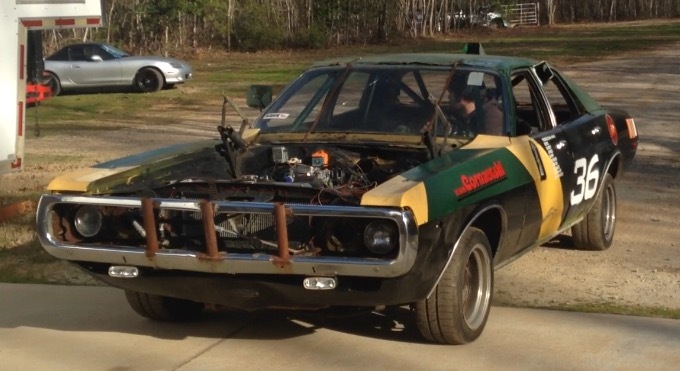 We'll keep up the work and have it ready for a shake down at Carolina Motorsports Park in May with the 24 Hours of Lemons race in September and bring you more coverage all year.